Western Monmouth Animal Control provides animal control services that are coordinated through the Freehold Health Department. Western Monmouth Animal Control is responsible for picking up stray dogs and cats in the Borough, responding to all animal complaints and concerns, and to ensure cats and dogs are properly licensed in the Borough. During regular business hours, you may contact Animal Control at 732 462-7057. 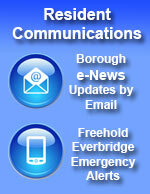 At all other times, please report your concerns to the Police Department at 732 462-1233.